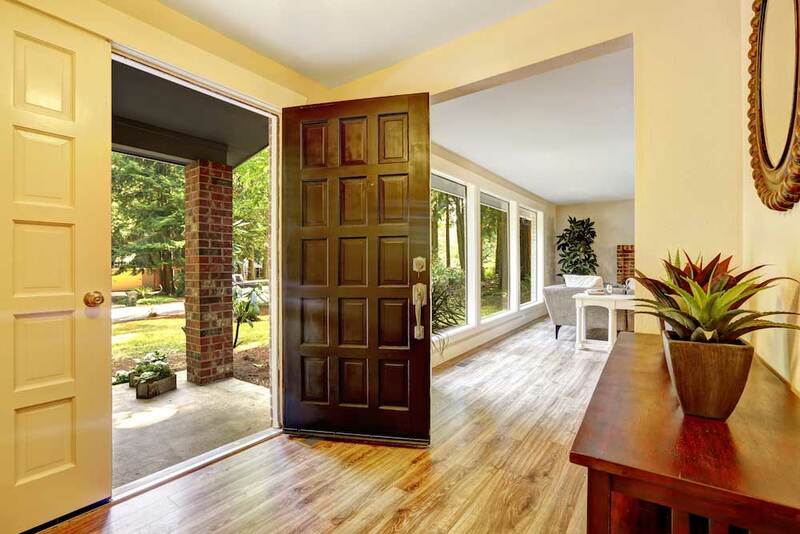 If you’re planning on replacing your entry door or are building a new home, do you know how to select the right door for your home? We recently encountered a situation where the wrong door was used for a newly constructed home resulting in door failure after only seven years. Beautiful Door. Wrong Choice For This House. Built in 2010, the home in Norton Commons featured an attractive, solid wood arched entry door. Based on curb appeal alone, the door was stunning. Unfortunately, it was the wrong door for this home and the door failed after only seven years. The wood had dry rotted badly and the door panel had two cracks that were so big they allowed daylight to come through. The homeowners decided to call in an expert to do a post-mortem on the door and find out why it failed after such a short period of time. After all, many wood doors last decades…why did theirs fail after only seven years? A wood door was a bad choice for this home because the home faces west and gets lots of sun exposure. Unless a wood door is well protected by an overhang or receives constant attention to the finish, it is not an ideal option for a west facing installation. Intense sun exposure wreaks havoc on most materials and is especially damaging to wood. One of our door experts, Karen LaMontagne, visited with the homeowners and identified the west exposure problem immediately. With that knowledge in mind, Karen suggested a Marvin Extruded Aluminum Clad entry door with wood interior for the new door. Marvin’s aluminum extruded cladding features a high performance coating that is so strong it has a 20 year warranty against chalking or fading. Next up was working through the arched shape. Karen knew a custom arched door would be an expensive option so she presented multiple alternatives for the homeowners to review. The homeowners choose a conventional rectangular shaped door with arched glass. The arched glass keeps the arch look that is shared with other architectural elements of the home. Compared to the original solid wood arched door (with no glass), the new Marvin door features mostly glass and provides terrific natural light for the home. The Marvin door also features a stained solid wood interior to keep the handcrafted feel they had with their original door. The homeowners loved that Karen spent a lot of time going over different design options to give them the perfect door for their home. 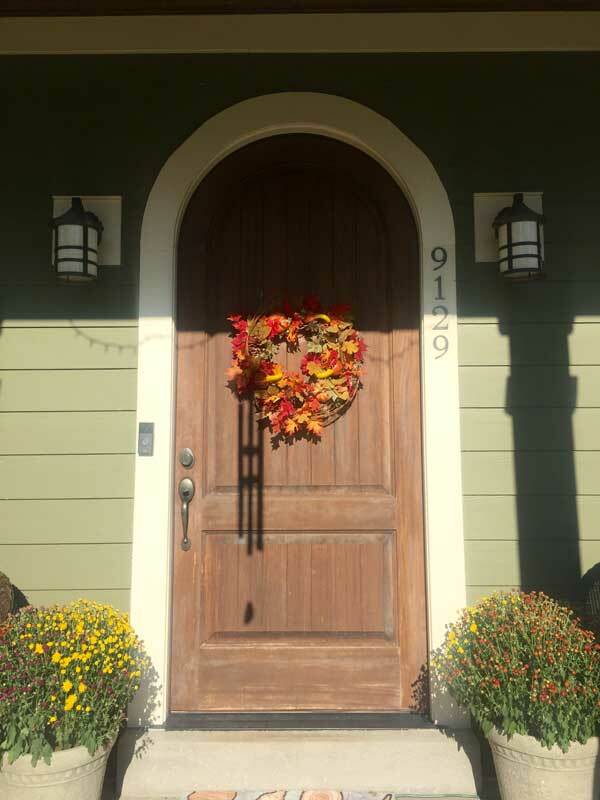 Karen’s design suggestion saved them more than $7,000 over the cost of a custom arched door. One of the homeowner’s pups loves the new Marvin door and is always ready to greet guests.Finding the right door for a home is the first step of the process. Bringing in our craftsmen to professionally install the door so it lasts is the final step. Our crew is specially trained to install doors and their attention to detail and finished result was obvious to the homeowners. The homeowners raved about the professionalism and cleanliness of our installation crew and are confident they now have the best door for their home. 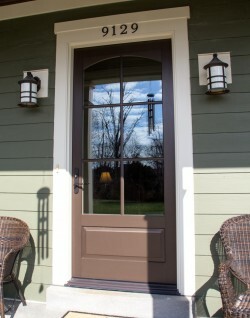 If you’re looking for the right entry door for your home, give us a call at 502-896-1717. We’re Louisville’s experts in windows and doors and we promise an outstanding customer experience.